What do young people and plastic have in common? They will both be around a lot longer than we will, especially the plastic. That is why so many young people are concerned about the plastic waste they are inheriting as it accumulates everyday on land, in the oceans, in their food chain and in their bodies. What's a kid to do in the face of all this bad news? Some kids are not waiting for adults to take the lead. They are taking to the streets to demand legislative change to control plastic pollution, they are making change happen in their communities and on their own school campuses, and they are educating decision makers about the impacts of plastic pollution. At Santa Monica High School, a group of students calling themselves Team Marine has become active in the legislative process to ban disposable plastics, the major source of trash in the oceans. Team Marine students recently staged their 6th Ban the Bag student march in four years. Over 60 people took to the streets of Santa Monica with homemade signs and creative "plastic monster" costumes made from plastic waste. The monsters represented the top offending single-use plastic polluters: bags, straws, water bottles, bottle caps, cutlery, and 6-pack rings. During the march, Santa Monica High students passed out free reusable bags courtesy of Heal the Bay, and their self-made flyers highlighting the problems of and solutions to single-use plastic bag consumption. Proud science teacher Benjamin Kay reports: "Their chants echoed from downtown building windows turning thousands of heads in our direction. Passersby honked their horns, smiled, and yelled in affirmation." At the end of the evening, during an unannounced visit to City Hall, the students staged a silent protest, during the city council meeting. Their attendance elicited a response from council members, who acknowledged their presence and declared a new ban the bag vote date for Santa Monica - November 23rd - after having postponed the vote date twice within October. We can expect the students to be actively raising support for bag ban votes and participating in upcoming bag ban hearings both in Los Angeles on November 16th, and at the November 23rd Santa Monica hearing. At nearby Brentwood School, the 6th Grade class initiated a "Water Bottle Project" to stop the waste from plastic water bottles on their campus. The students researched issues such as adding spouts to the drinking fountains, the environmental impact of the school's plastic water bottle use, policies in place at other neighborhood schools, as well as the cost of various canteens. "Everyone in our group worked together. Each one of us was responsible for a step," explained Harrison V. "This was our first project connected to the real world." At the culmination of the project, reusable canteens were distributed at a special ceremony. Brentwood School administration took the project to the next level with installation of hydration stations manufactured by Elkay. These hydration stations offer students the choice of a traditional fountain experience with cold clean filtered water or the opportunity to fill their bottles to drink on the go. 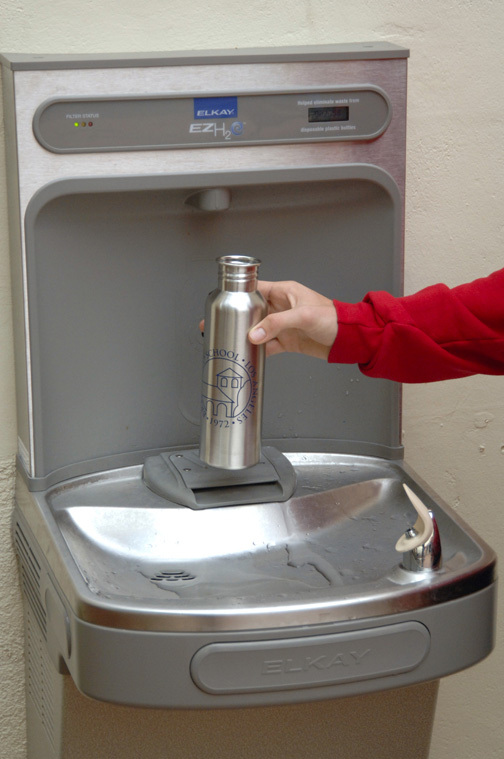 Adding to the educational experience, the fountains calculate the number of plastic water bottles avoided over the use of the fountain. The fountains have proved to be enormously popular and bottled water is no longer sold or offered on the Brentwood campus. Young people are among the best communicators on the issue of plastic pollution and its impacts. At Plastic Pollution Coalition, an international non-profit dedicated to stopping plastic pollution worldwide, youth members of the Plastic Pollution Coalition's Advisory Council will address an international audience in a live webcast event called TEDxGreatPacificGarbagePatch on November 6th 2010. The world will hear from JD Russo, a student at Carmel High School, a volunteer guide at the Monterey Bay Aquarium and an outspoken advocate of alternatives to plastic. He strongly believes in the power of the public to affect change, and that people need to be personally connected to the issues in order to be engaged. In his words, "we must raise not just more awareness, but raise care." Also scheduled to speak at the TEDx conference is Jordan Howard, an 18 year old graduate of the Environmental Charter High School in Los Angeles, California. At the age of 15 when she was still a high school student, Jordan began a path as a teacher, educating others on the importance of living a sustainable life. She has created environmental films and spoken to thousands of youth and adults about sustainability, education, and youth empowerment. She opened for Hilary Clinton at the nation's first carbon neutral political fundraiser for President Obama's election campaign and keynoted the City of LA's International Environmental Youth Conference. She organized and led the Rise Above Plastics Student Speaker Series, where she trained students to give presentations across Los Angeles about the harms and solutions to using disposable plastics. Jordan is the editor of the book, "Green My Parents" that trains kids to teach their parents how to save money while living sustainably. Why are young people so concerned about plastic? Plastic does not biodegrade and every bit that has ever been made is still with us in some form, even if it has been down-cycled to another use. The amounts of plastics that enter our environment are astounding. Globally we use in excess of 260 million tons of plastic every year, accounting for approximately 8 per cent of world oil production. But the impacts on the next generation don't stop with the degradation of the planet's resources. Plastic has entered the food chain as it is ingested by the seafood we consume. In addition, we are poisoning ourselves and our children through plastic-packaging. A current Senate Panel is examining the effects of chemicals, including those that leach from plastic containers, into food and drink. The effects of this chemical pollution is most frightening for developing fetuses and children who's organs and systems are in development. A number of diseases including cancers have been linked to endocrine-disrupting chemicals from plastic. You can watch youth leaders JD Russo, Jordan Howard and some older folks like Syvia Earle, Charles Moore, David de Rothchild, and Fabien Cousteau on line November 6th by registering to have a viewing party for TEDxGreatPacificGarbagePatch. And let us all raise a reusable glass to toast the remarkable young people who have begun the process of educating, engineering solutions, and legislating to control plastic pollution for the next generations who will have to deal with our waste.